Summer Lily tapestry is a work showing the beautiful work of Vail Oxley. Water lilies are seen beautifully decorating the foreground, with green foliage gently lit by the sun, and contrasts with the mirror like pond lake topped with water lily pads. The shiny water complements the flowers beautifully, and reminds the viewer of the style of impressionism created by Monet. Full of gorgeous colors of magentas, fuchsias and yellows, the plants and flowers provide a color relief above the blue violet water. The fragrance of these lilies can almost be imagined due to the beauty of this work. A gold border completes the work. 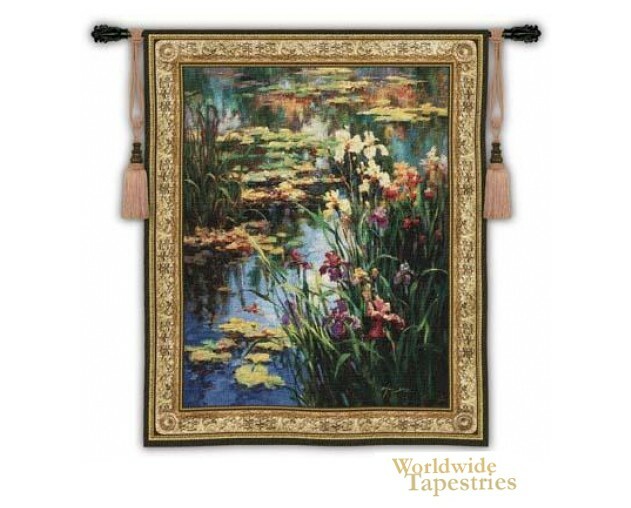 This Summer Lily tapestry is backed with lining and tunnel for easy hanging. Note: tapestry rod and tassels, where pictured, are not included in the price. Dimensions: W 53" x H 64"